I’ve been assisting my small business clients with their websites for several years, but I’m now stepping into the ring directly to fill a need. Most small business websites don’t need to be complex, they don’t need all the bells and whistles, and they don’t need to be expensive to set up or maintain. They do need to look professional and give your customers and prospects the information they need, when they want it. When small biz owners hear about something called WordPress, they may think it’s software only for blogging. But WordPress.org is software that runs your own professional website, on your own domain name (i.e on your own .com). 20% off all sites on the internet are created with WordPress software, many of them are professional sites from large organizations. But it works really well for small businesses too. by the way, if you do want to add a blog, it’s built-in, although not all businesses need one. Business websites also need to be easy for you, or someone on your staff to update and maintain; the WordPress software makes this pretty easy too. No “HTML Coding” or tech knowledge is needed. When was the last time you used a phone book to look up a business? The last time you wanted to check the hours a business was open, or looked for a type of business in your area, I bet you “Googled” or searched for it online. Having a simple online website gives you a virtual home on the internet. The software I use even automatically makes your website tablet and mobile phone-friendly, adapting the information to fit the size of the screen used to view it. 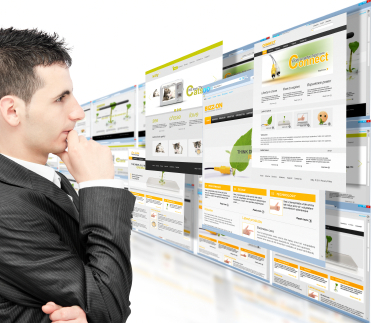 What Does a Well-Designed Website Do for Your Business? It allows new customers to find out that your business, products or services exist, even if they’ve never met you. It provides info on your business: location/region you cover, hours of operation, business services etc…24/7. It reassures prospective customers that your business is professional, especially for people who grab a business card, see your .com on your truck, or on a sign in a shop or in a yard of a house where you are working (for contractors). They can check your business out at their convenience. What Types of Businesses Benefit from a Simple Website? Most businesses benefit from having an online presence they own. Some small business owners are happy running their online presence through Facebook or Etsy. But I caution folks, you don’t own your Facebook page…Facebook does, and they keep changing the rules. Facebook and other social media sites can be very useful, but you need a hub, a virtual home, that you own and control. Creating your own website fills that bill. Contractors – plumbers, repairmen, carpenters, painters, landscapers and lawn and tree care, stone masons, electricians. Service Businesses – from consultants and professional services (lawyers, PR & marketing professionals and more) to personal service businesses like chiropractors, nail and hair salons and restaurants. Shop Owners – gift and antique shops, flower shops, most bricks and mortar stores that are selling a product. You might not need to sell your products online, but giving your store a home on the internet will help people find you, figure out your hours and make it easier to tell their friends about your shop. Small non-profit and arts organizations – dance companies, art galleries, community-based organizations etc. Artists and Craftsmen – I’m developing a separate website targeted to helping creating websites for artists and craftsmen. I go to craft shows often, and half of the business cards I get just have a phone and email address but no website I can go to and look at their work later, or want to find their next show. Pottery and photography are hobbies of mine, so I have a soft spot for artists. These are some of the types of business owners and organizations that, with a small investment of time and money, can get a simple site online and really help get the word out about what they do. I’ll be posting more info on simple website design for small business soon, and the steps you need to take to prepare. If you feel the need of a more complex website, I have partners I work with that can customize a WordPress designed site even further. If you are interested in a half-hour complimentary consultation, send an email via my contact page and we’ll set up a time, or call 484-802-7576. Feel free to ask me questions as well, either via email or the comments below. I might turn the answers into my next post, as well as reply to you directly. I worked with a local Pottery teacher and artist Bob Deane to set up his site BobDeane.com. As a potter by hobby, I had fun with this site finding the right words to help Bob articulate his artwork for the website. He is not that comfortable with technology, so I had to find ways to make the process work more easily for him. We are still adding photos of new work as they get are fired in the kiln and photographed. Another newer site is for the inventor of a prototype of a solar car www.HJOSolarCarsETC.com. My client’s website we created for her new book “How to Negotiate a Killer Job Offer” www.JobSecretAgent.com. Another site I’ve created, this one for a lawn care contractor: http://DelawareValleyTurf.com. Another site I worked on is 5 Rhythms Philly dance website: http://www.5rhythmsphilly.com/ – This was a site where I assisted the organization in creating an DIY site. The dance graphic behind the site shows through this Studio Press child theme in a very cool way. I’ve also set up a site for my own pottery hobby when I had a pottery show last year www.PinchPotIdeas.com. More new sites coming soon. To see everything in one package click Keep It Simple Web Design to check out my web design site and portfolio.